The first thing I should point out is that these notes were originally typed a few years ago (11-1998) the day after attending my first ever Off-Road driving lesson. 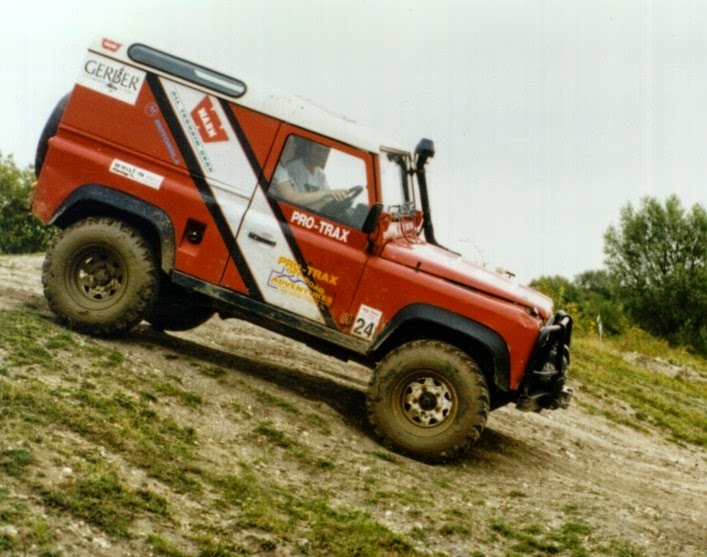 Since then I have been on a second training course and taken part in several Essex Land Rover Club trials and a few Green Laning trips, both organised and with friends. I am not an expert. If anyone finds any mistakes please leave a comment so that I can correct them. These notes were originally to remind me of the techniques I learnt on the training days. My wife and I are now on our second Discovery and go off-roading whenever we can. Don't rely on these notes, go on a training course first. 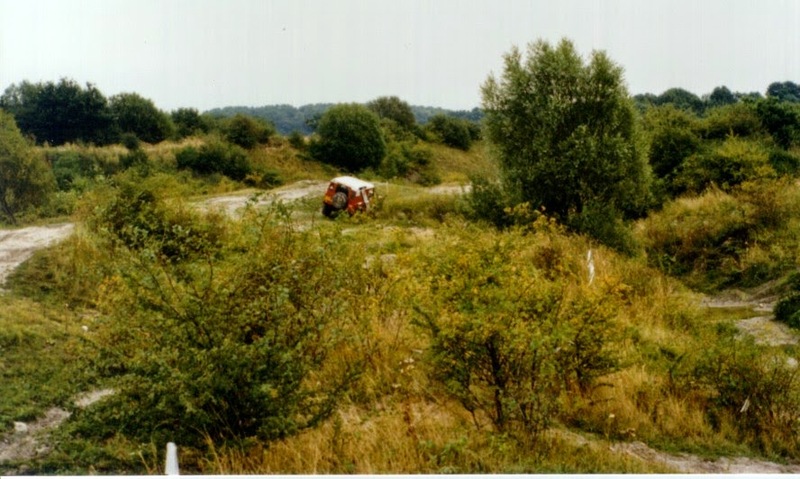 Contact 'Pro-Trax' or another off-road driving centre. Keep your thumbs out of the steering wheel. Grip the steering wheel securely at all times with your fingers and the palm of your hand. Your thumbs must not be inside the wheel, if the front wheels get caught the steering wheel could spin round and hit your thumbs. It hurts, but you'll remember after the first time. Make sure all luggage is secure. Flying tools, bags and boxes are more likely to kill or injure you than anything else. Tie it all down securely. Always walk areas first. Unless you are sure of an area, get out and walk the track before continuing. What types of 4 wheel drives are there? Part-time 4 wheel drive, in two wheel drive mode they are more like a normal car. In 4 wheel drive mode they can only be driven a short while due to transmission wind up. Transmission wind up, is caused by the front and rear wheels traveling at different speeds round corners. This is because the outer wheel is traveling round a larger circle than the inner wheel, so the outer wheel actually goes round more and travels a greater distance than the inner wheel. The differentials, one in each axle, share out the power to the wheels, so that the outer wheels when turning a circle can rotate faster than the inner wheels. All cars have differentials otherwise the car would not be able to turn a corner very well. One wheel would always be dragged round rather than pushing the car round. On a four wheel drive car these differentials are still permanently attached to the engine at one point. The front pair of wheels are also traveling at a different speed to the rear wheels, when traveling round corners. This can mean that the drive shafts, which at one point are connected together, are traveling at different speeds, gears eventually mesh tightly and the drive axles twist. Sometimes a wheel will spin to release pressure, but on Tarmac with good grip this is unlikely and a drive shaft may break instead! Part-time 4 wheel drive, runs in 2 wheel drive most of the time to prevent transmission wind up. When you engage 4 wheel drive on a surface with good grip, you must only do it for a short time. Differentials, share out the power from the engine to the two drive shafts connected to them and then to the wheels. The way they work means that power is always sent to the wheel with least resistance. This means that if a wheel comes off the ground, you get NO power! It also means that in reality only one wheel in a pair ever has drive, so a 4 wheel drive really only has drive to two wheels at any one time, one at the front, one at the rear. It probably sounds that differentials are more trouble than they are worth, but this is not the case. Without a differential, the vehicle would be pushed in a straight line, because all the wheels would rotate at the same speed regardless of the distance each was traveling and regardless of where the front steering wheels were facing. Some competition (and other) vehicles can lock the differentials on the front and rear axles. This is useful for some situations, but you must know the consequences of doing that. The vehicle will not steer very well, if at all! The advantage of part time 4 wheel drive, in 4 wheel drive mode, is that regardless of the angle of the axles two out of the 4 wheels will have drive, however without a central diff. you get transmission wind up! 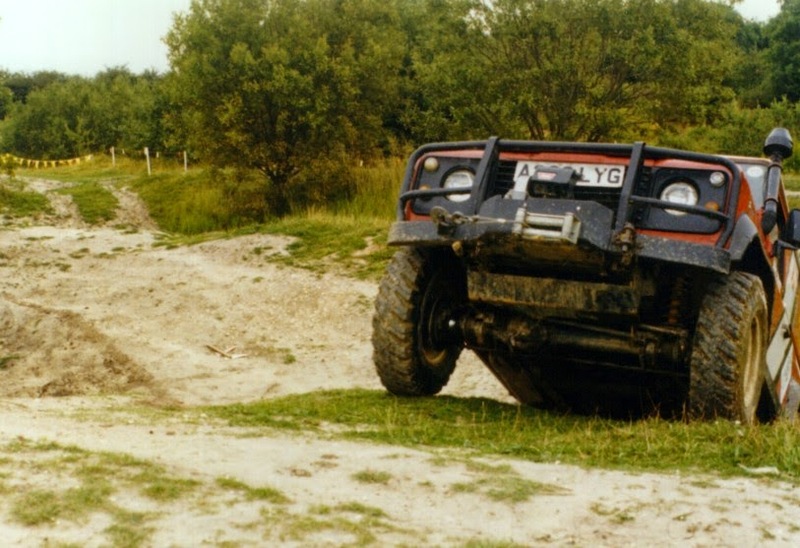 Full time 4 wheel drive vehicles, like modern Land Rovers, use a central differential to share the power out between the front and rear axles. Sounds good, stops transmission wind up, but as power is distributed to the wheel with least resistance, you can end up with only one wheel that has power! The answer is to have a diff. lock, which simply stops the central differential working. Now you have power to two wheels, like a part time 4 wheel drive, in 4 wheel drive mode. You can safely engage the diff. lock while moving, but you should engage it before you approach difficult terrain. It's probably too late to engage it once the wheels start spinning and churning up the ground! Remember to turn it off when you've finished the difficult section. The dashboard should have a warning light to tell you the differential is locked. On Land Rovers (and probably other makes) the light actually indicates that the transmission has wind up. If the light does not go out after disengaging the diff. lock the gears are probably bound together and you need to drive in such a way as to free them. I've found different amounts of wind up are freed in different ways. A little wind up will go after a short drive, the more corners the better. A lot of wind up can take a long while to clear just by driving (it's taken 15 minutes sometimes.) Better is to spend a minute or two reversing. I also found reversing round a corner, is better than a straight line. You need to know the angle of hill it can tackle both going up, down and over. A tow bar was recommended to protect the car. It reduces the angle at the back, but does protect from some damage. With a little momentum, and if you don't mind the bump of hitting the tow bar, you can ignore the departure angle on soft ground. The most important thing when driving off-road is to read the terrain ahead. Look ahead and decide the easiest route. Try to avoid anything under the car that could cause resistance (drag). You should always be in control of the vehicle. If at any time you slide sideways you are no longer in full control of the vehicle. You can not slide sideways if you are on the level. When driving always look for the most level path. Only attempt a side slope if there is no alternative. Straddle existing tyre tracks, except going up and down hill, when they may be useful to keep you in the right direction. Remember that if you can't avoid the ruts you may be pulled in to them and they are often impossible to get out of. If you get in tyre tracks look for the shallowest point or low edges to get out. Cross ditches and tyre tracks at an angle, step over them slowly one wheel at a time. Never go across at right angles, when both tyres could get stuck at the same time. Always remember, slowly, in a low gear, there's no rush. When looking at the terrain decide in advance which wheel will have least resistance and therefore most likely to spin (See Differentials for more details.) In most cases the wheel further down a hill, or in a ditch is the one which will have the most resistance, so the highest one is most likely to spin! How do we go up hill? Low gear, give it a little controlled acceleration just as the front wheels start to go up the slope. Keep the power on until just before the top and then ease off so that you are stationary at the top of the hill. You never know what is the other side of a ridge. So you MUST always stop at the top to check. How do we go down hill? Put it in to the lowest gear, and let the idle revs pull you over, then drive down without touching any of the pedals. DO NOT use the brake. The engine will slow the vehicle down to just the right speed to go down the hill. What do I do if I get stuck or have problems climbing a hill? This is called a failed hill climb. That's when you stall the engine or for whatever reason, stop part way up a hill. Usually the best way out, is to get back to the bottom, safely, and start again. If you remember that at all times you should be in control, the way out is simple. Reverse down the hill. There is going to be a problem putting the Land Rover in to reverse, because as soon as you touch the clutch, you will lose engine braking and crash down the hill! What to do to get back down? At this point the engine is OFF. Pump the brake pedal a couple of times, the last time, pushing down as hard as possible and then then let go. This is to make sure the brakes are clear of debris and working. Straighten the wheels, look out the window to make sure the wheels are straight. I can't emphasis this enough, people have died because the steering wheels are not straight, and the vehicle turns over! Hold the brake down very, very hard, and pushing the clutch down, put the vehicle in to reverse gear. Raise the clutch slowly making sure the vehicle is held still. Slowly release the brake making sure the Land Rover is held by the engine braking. You should now drive slowly backwards down the hill to where you came from. You can now try the hill again. Getting you out of trouble on a failed hill climb. You need it to hold the vehicle still while you press the clutch down to put it in to reverse gear, for the descent. Apart from that the brake was not used at all, everything is done at very slow speed using the low gears. The engine braking of the Land Rover will hold the vehicle stationary, even on a steep slope. To change gear. Never do it under load, for example, that's when you're going up or down hill. Firstly some safety advise I was given, was to close your window. If the vehicle should role, the natural instinct is to put your arm down to save you. One arm will not stop two to three tonnes of Land Rover, so don't try it!!!! These are potentially the most dangerous things to attempt. Only ever do a side slope if there is no alternative. Land Rovers can go along very steep slopes, but it feels, and is, dangerous. Tackle the slope in the lowest gear, diff. lock on (if you have one). Move as slowly as possible. Keep in your mind an escape route. You must ONLY TURN DOWN HILL, never try going up hill, the angle increases and you are liable to role over! Remember you can always stop. Always look out for indents in the ground of the lower wheels and bumps on the ground where the upper wheels will travel. Either case will change the angle of the vehicle and possible topple you over! As I said, only attempt side slopes, if there is no other route. How do I cross shallow water? Slowly in to the water, like approaching a hill. As the front wheels enter the water accelerate out. Basically you don't want to stop in the water. The momentum of over two tonnes of vehicle, should pull you out, even if you stall... if you get it right. Always be careful with water, you never know how deep it is. If in doubt, use a pole or long stick to test the bottom. Check along the route you intend to drive, testing where the wheels will be. Remember, your vehicle is a lot heavier than you are. River beds can have pot holes, or can become deep. The mud at the bottom may not be able to support the weight of a vehicle. Deeper and longer stretches of water can be crossed but then you need to worry about bow waves. That's not covered here. Have proper training, I can't repeat it often enough. It's also fun, because you are under expert supervision, it will also be safe. 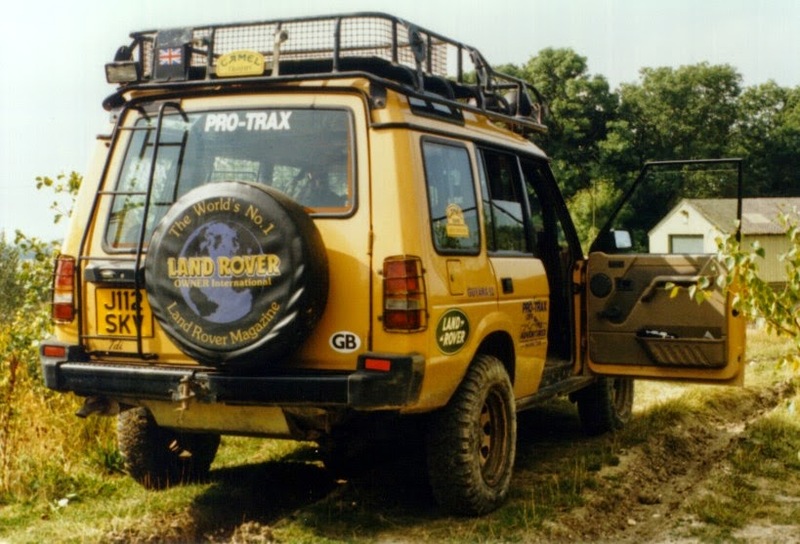 You could also join a 4 wheel drive club like one of the Land Rover clubs dotted about the country. My wife and I joined a local organisation the Essex Land Rover Club.